Graduate student forward Tyler Cavanaugh's seventh double-double of the season was not enough to put GW over Richmond Saturday afternoon. RICHMOND, VA. — When men’s basketball hosted Richmond at the Smith Center four weeks ago, the Colonials were outmatched early on. The Spiders shot 64.0 percent in the first half and led by as many as 23 points in the second half. With roughly 13 minutes left to play in that game, GW mounted a comeback and cut the lead to four points before ultimately falling short. The Colonials experienced some déjà vu Saturday afternoon at the Robins Center: struggling out of the gate, conceding 51.7 percent shooting from the field during the first half and finding themselves down 16 early in the second. Again, around the 13-minute mark, GW’s offense came alive and climbed its way back into contention. The visitors managed to make it a two-possession game three times, but again, the were unable to complete the comeback against their Atlantic 10 foe. In the end, Richmond (14-9, 8-3 A-10) held on for the 84–75 victory over GW (12-11, 4-6 A-10), sweeping the regular-season series 2-0. The loss is GW’s second straight and sixth in conference play. The Spiders were energized and led by senior forward T.J. Cline and sophomore guard Khwan Fore. The duo combined for 50 points on 17-for-26 shooting from the field, including four three-pointers, to go along with 16 boards. Cavanaugh led the Colonials with 23 points and 10 rebounds on the night, picking up his seventh double-double of the year. Graduate student forward Patrick Steeves (12p), junior guard Yuta Watanabe (11p) and freshman forward Arnaldo Toro (11p) all also reached double-figures. Overall, however, GW did not shoot well from the floor. The team finished with a 35.6 percent clip from the field and went just 24.1 percent from behind the arc. The performance marked the Colonials’ worst shooting percentage since their first conference matchup on Dec. 30. 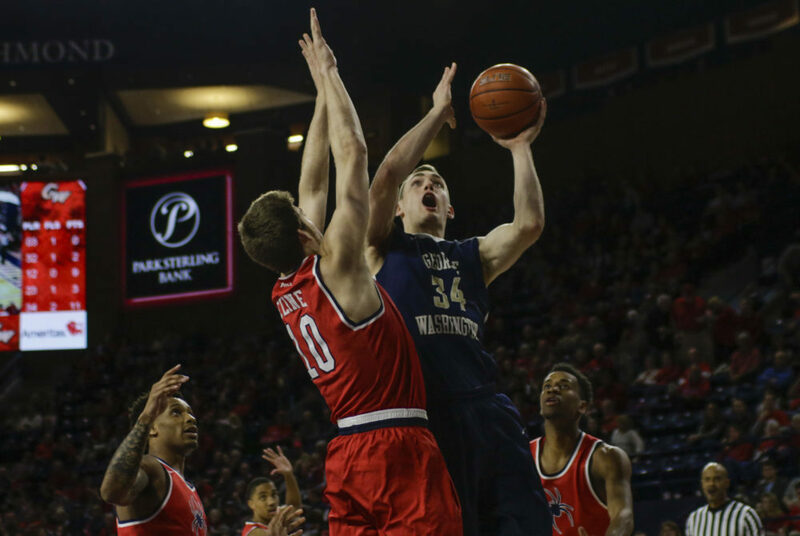 GW also had to play without Cavanaugh for much of the first half after he was assessed his second personal foul during a post-whistle scuffle, forcing Joseph to limit his minutes. GW only remained in the game, and finished with 75 points because of an impressive persistence in getting to the free-throw line. The Colonials shot 26-for-30 from the charity stripe, accounting for more than a third of their point total. Cavanaugh started the game looking unguardable offensively. He sunk all of his first four shots, including a corner three, scoring each of the first nine points for the Colonials. The team’s leading scorer carried GW to an early lead, but it did not last long. A three-pointer from Richmond freshman guard Nick Sherod gave his team the lead for the first time in the game, a 12–11 advantage just over five minutes into the action. The Spiders maintained that momentum and built a 27–13 lead after a 13-0 run that included multiple Colonials’ turnovers and a desperation shot from distance that found its mark. In the final five minutes of the frame, GW’s offense looked more composed and organized, often getting open shots at the basket. The Colonials cut the lead to single-digits on three separate occasions but were unable to hold the margin under 10 points. The Spiders went into the half leading 46–34 after dominating offensively and forcing the Colonials to take difficult shots. Richmond kicked off the second half with the upper-hand. The Spiders sunk four of their first six shots during a stretch where GW was unable to make any. After trailing 56–40 with 15 minutes remaining in the game, the Colonials began their comeback. Seven consecutive points from Toro and three points the old fashioned way from Cavanaugh quickly resulted in a 10-0 run. Although the Colonials were going punch-for-punch with the Spiders in the final minutes, Richmond would not let them back in the game easily. The home squad continued its hot shooting, countering any momentum that GW gained at the line with aggressive drives and consistent movement. Richmond missed four free throws down the stretch, but fought off GW’s final efforts that extended nearly to the final buzzer. “This one hurts because I thought we had it,” Cavanaugh said. The Colonials will return to action back at the Smith Center on Wednesday night when they play host to VCU. Tip-off is scheduled for 9 p.m.